I am so thrilled to be part of the Social Thinking Blogging team. As part of the team, I’ll be bringing you reviews of Social Thinking products, curriculums, books and conferences. If you are not familiar with Social Thinking, don’t worry. In each post I’ll give a quick explanation with links for more information. I have been using the Social Thinking Framework in practice with children aged 3 through middle school for about 7 years now. If you work with children with social-cognitive disabilities (or have a child who struggles with social skills and understanding social rules), I HIGHLY recommend the Social Thinking Framework. Disclosure: I was provided the book in this review at no cost in exchange for an honest review. As always, all thoughts and opinions are mine. There are affiliate links to Amazon in this post for your convenience. Social Thinking® is a teaching framework for individuals aged preschool through adult, created by Michelle Garcia Winner, CCC-SLP (I’ll refer to her as MGW) (www.socialthinking.com ). It consists of a Social Thinking Vocabulary that establishes a common language to discuss social functioning, curriculum lessons and strategies that break down social concepts into concrete, teachable formats, and the Social Thinking-Social Communication Profile, a tiered informal assessment tool that helps educators and clinicians better understand different levels of social cognition and match teaching strategies to the social strengths and challenges of the individual. Social Thinking “explodes the social code” to help children and adults learn to be better social thinkers and social communicators. This book is part of the Social Thinking Curriculum by Michelle Garcia Winner and Pamela Crooke (who I just saw speak at the Social Thinking Conference!). This book defines many of the Social Thinking Vocabulary terms within a fun, and engaging format: like a social story/comic book hybrid type style. The book then explains the who, what, where, when and why of these Social Thinking Terms and Skills with large, simple pictures. The book is designed for school aged children (K-5th grade) or immature older children. However, the authors stress that this book isn’t just for kids. They share that this book can also be used as “as way to introduce the concepts of Social Thinking to general education teachers, paraprofessionals, parents, caregivers, special educators, grandparents, siblings, day care workers…” and others. What Does this Book Target/Teach? This book teaches our children how to be Social Detectives and how to use their Social Detective Tools and Social Smarts to be able to figure out what is expected and what will happen next. 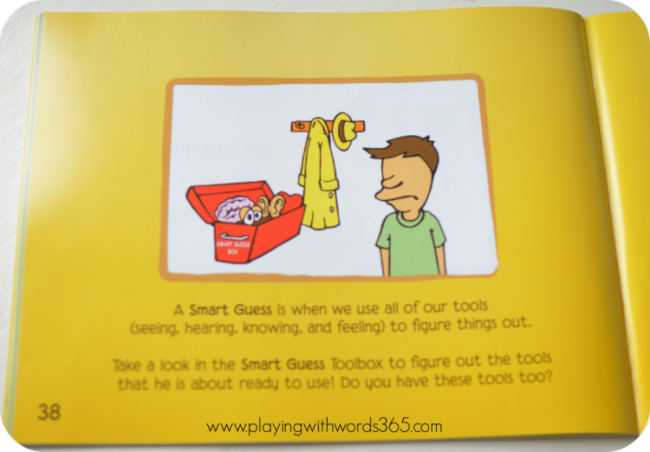 I think it would be FANTASTIC to make actual, tangible tool boxes for kids with images of these tools while doing different Social Thinking lessons. In addition to the toolbox, I like the general set up of the book and the way the different terms are explained in more simple language. This s not a book you sit down and read in one sitting though. You will want to take your time and take it one age at a time if needed. I read this book to my typically developing daughter (4.5) just to see what she would think…and there was too much information for her little brain to take in! So remember that there are a LOT of terms and that it will take TIME and REPETITION for our fiends with social-cognitive deficits to understand then use these terms/methods. The three lessons at the end of the book are great ways to continue the curriculum practice beyond the book. If you use the Social Thinking concepts in your practice, I think this is a great tool for your tool box. Also, like they talk about in the book, this book can also be a great INTRO to the Social Thinking terms for parents and teachers in addition to your students. 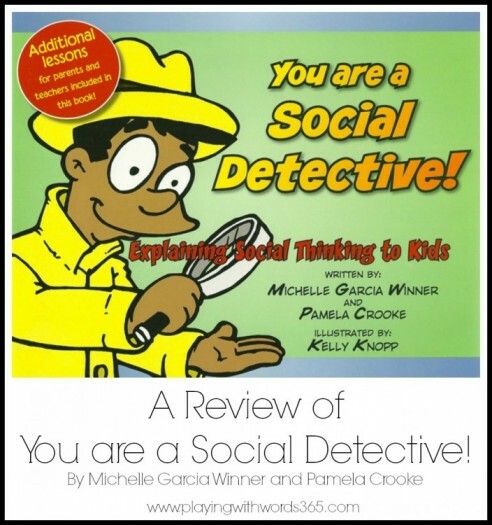 You can purchase You are a Social Detective: Explaining Social Thinking to Kids at Amazon or on the Social Thinking Website.